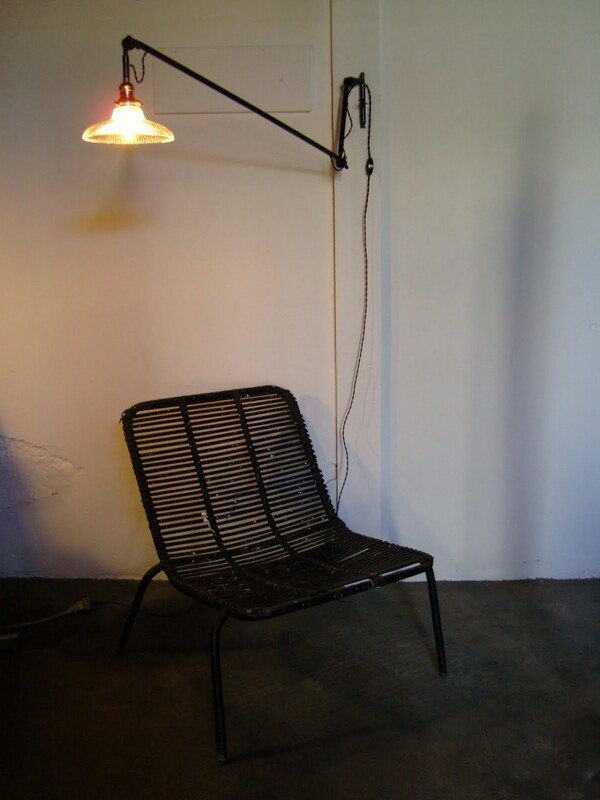 Design for Men (former blog) reader, Olivier Abry of Wo and Wé Collection has been interested in vintage furnishings, especially lamps for a long time. 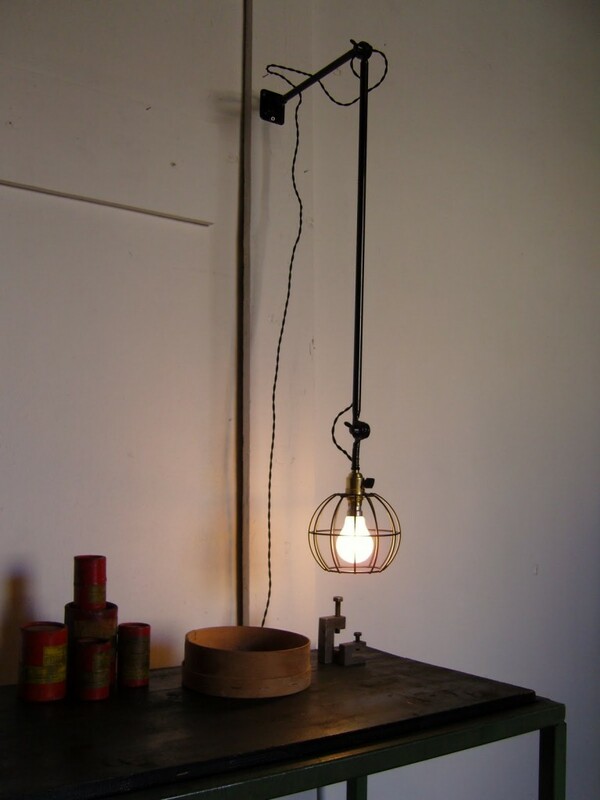 &nbsp; Abry, who lives in Lyon, France, started creating industrial light fixtures by assembling and restoring vintage objects just three months ago.&nbsp; He now considers himself a “light creator-assembler”, a title I love.&nbsp; After clicking on his site, I realized that the title fits as his talent and attention to detail blew me away. I was also a bit jealous but that’s beside the point. The fixtures are both sleek and functional. 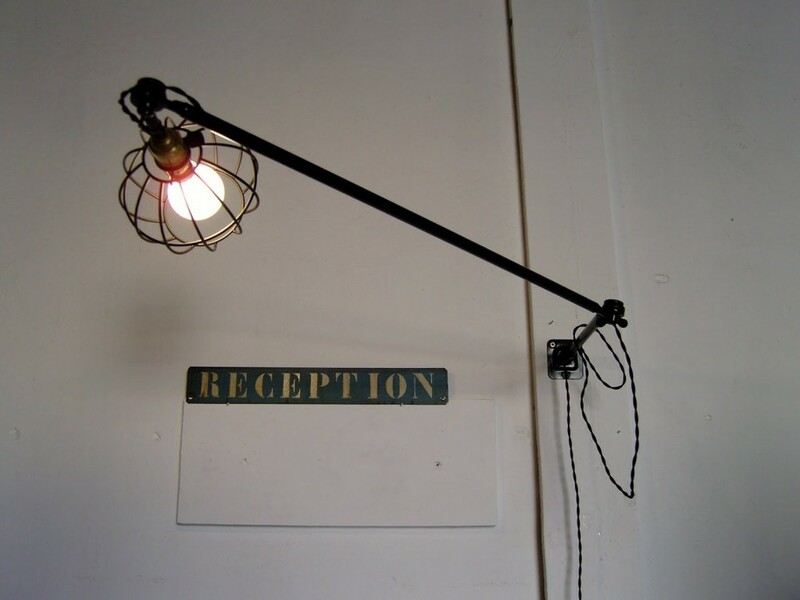 His adjustable arm fixtures remind me of the fixtures by Workstead published earlier this summer. And pricing is reasonable despite the exchange rates that may apply. The following are a few favorites. Merci beaucoup Olivier pour la présentation! Votre travail est incroyable et bonne chance avec la collection! My sincere apologies as my french is very rusty. Surrounded by construction, I have become incredibly inspired by scaffolding. 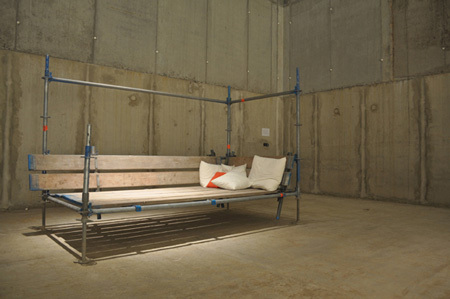 All of sudden, it came to me – scaffolding would be great for creating a bed and perhaps many other pieces of furniture. 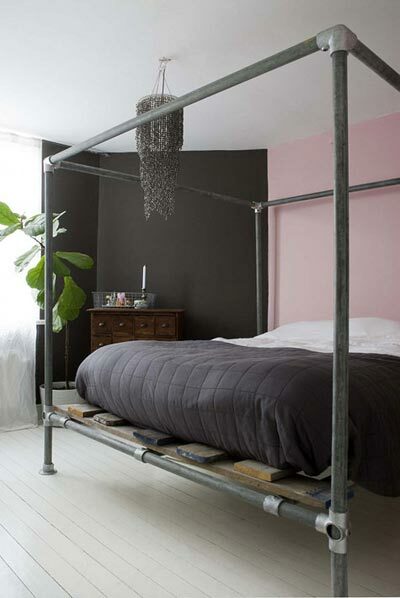 So I am just inspired…I am considering making a headboard out of scaffolding for my place. The following are some great pieces for inspiration. 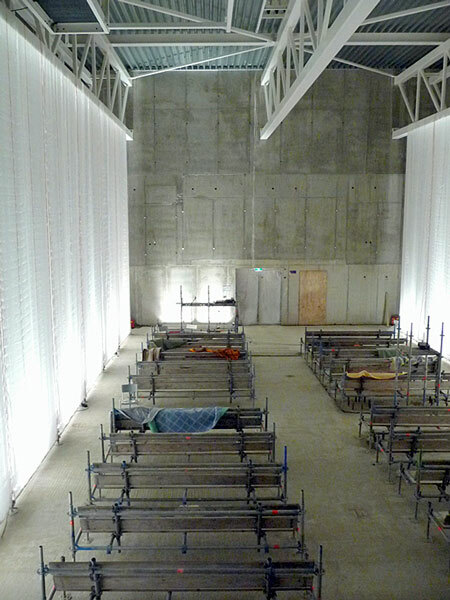 Designers Maartje Dros and Francois Lombarts used scaffolding to turn a construction site into a conference area. 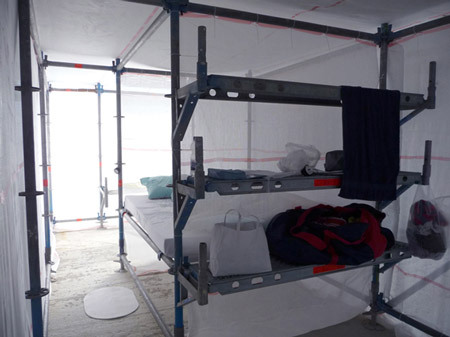 The project, called Motel Out of The Blue included meeting rooms , lecture hall (pictured above), dining room, library and 50 rooms (above) for visitor accommodation. I particularly love the day bed…I could see that transformed into something really comfy for indoors or outdoors. Blik provides a line of self-adhesive wall decals (large stickers) that can be used to inexpensively and temporarily transform your space. Blik decals can be applied to any flat surface including walls, windows, mirrors, ceilings, tabletops, or flooring. When you tire of things quickly like I do, then you can simply remove and re-envision. Also, decals can be customized to work with your vision of your space. 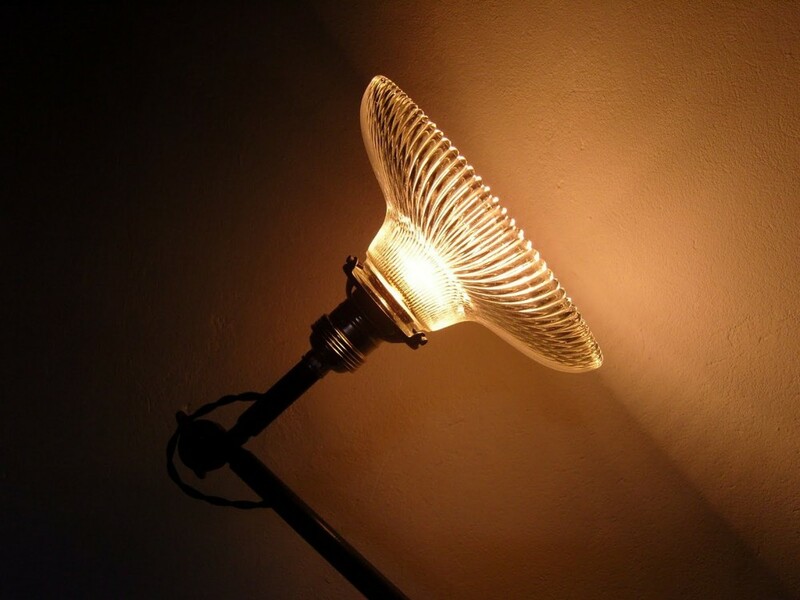 The photo above illustrates a custom installation in a home. I stumbled upon these tables from Brandner Design and was immediately blown away. The company creates furniture incorporating structural elements including trusses, beams, and reclaimed materials. I especially love their tables which elegantly blend the industrial with contemporary style. Brandner also accepts custom orders. 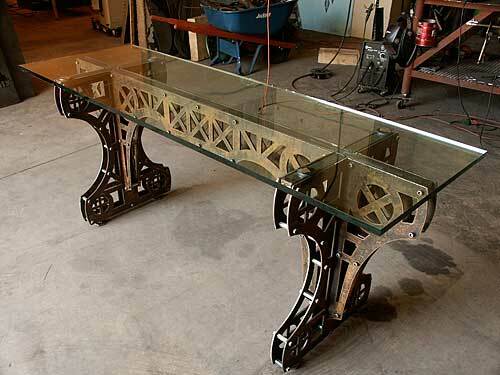 So, I would love to adapt the above “Great Northern” Console table for a desk in my office. I am thinking walnut slab top with same base. The above tables are some of my other favorites. Over the memorial day holiday, I had ambitious plans to catch up on work but I was quite distracted by the pool opening at my building. My obsession with swimming is the inspiration for this article featuring some of my favorite pools. 1. 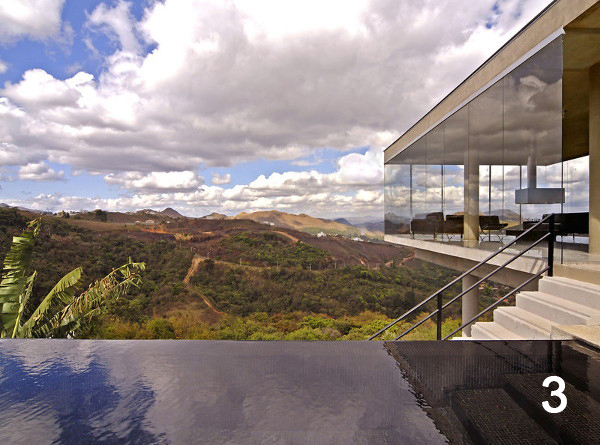 LOHA: Lorcan O’Herlihy Architects, Jai House, Calabasas, CA, 2004. I had to rely on my oddly photographic memory for this one…I recalled seeing this stunning home featured in Men’s Health Living Magazine, a men’s home magazine that I was sad to see dropped in 2008. Richard Roll, a former corporate attorney turned entrepreneur/entertainment lawyer who transformed his career and his lifestyle to be more focused around his passions. His home is an inspiration, perfectly designed to incorporate his love for his family, the outdoors, and swimming. Limited on space, the one-lane lap pool was the perfect solution for this competitive swimmer. To read the full article click here. Loving the rooftop lap pool (yes this is a trend) but these pools are efficiently sized for exercise and relaxation. I am a sucker for an infinity edge pool. Infinity edge pools appear to to go on forever, an allusion created by running off the edge – typically found in areas with cliffs or architectural cantilevers. In this home, the pool works perfectly with the horizon and the location of the pool next to the stair creates wonderful mystery when people descend the stair. 4. Richard Neutra, Kauffman Desert House, Palm Springs, CA, 1946. I had to include one of my all time favorite homes which also includes a fabulous pool. Check out this recent D4M article for more info on the home, by clicking here. This article needed an indoor pool and this one is a serene beauty in a stunning home in the forest. For more photos and info, click here. Wallpaper* is wild about Brazil after moving operations there for several weeks for their Born in Brazil issue. Rather than simply taking a snapshot of the country in the issue, Wallpaper.com will be updated for the coming weeks with more news, video coverage, interviews and more. After checking out the directory of architects, I can see why they want to continue this story. 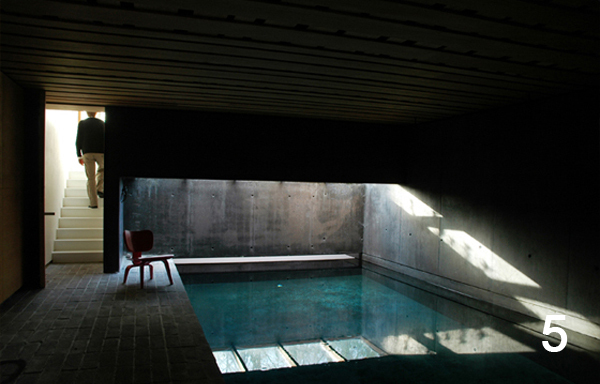 I have included some of my favorites fromthe directory of architects. 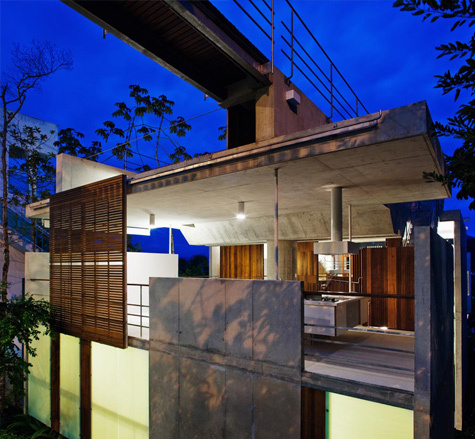 To check out the directory of Brazilian architects on Wallpaper.com, by clicking here. 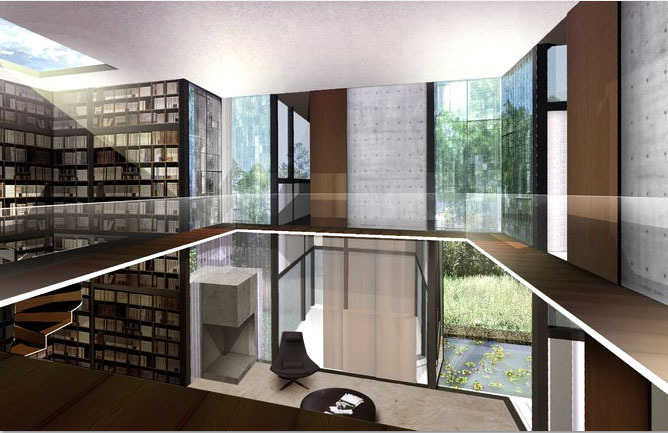 While perusing the Studio Dror website, I happened upon this stunning concept for a modular villa in New York. Decidedly modern in design, the pre-fab modular structure is inspired by Villa Rotunda, designed by Renaissance architect, Andrea Palladio and completed in 1591. In this modular home, the wings or cubes are constructed off-site and connect at a central living room with a balcony. The layout is reminiscent of Villa Rotunda with the salons connected by the central circular hall which also features a balcony. The translation from classical architecture makes this modern design both efficient and stunning. Check out the Studio Dror site for more info by clicking here. Designed by Platform 5 Architects of London, Mapledene Road is a renovation of a property that was formerly a crack house located in the conservation area of Hackney, a borough of London. The design team revived this structure creating spaces that flow into each other. The exposed brick on the interior adds warmth. Subtle architectural moves add life to the facade while creating extra living areas within. One of my favorites is the protruding glass cube with window seat. As for decor, I love the simplicity of the palette punched up with pops of color as in the lavender chairs in the dining area.